WASHINGTON (Reuters) - Staff at the U.S. Environmental Protection Agency have been told that President Donald Trump is preparing a handful of executive orders to reshape the agency, to be signed once a new administrator is confirmed, two sources who attended the meeting told Reuters on Wednesday. A senior EPA official who had been briefed by members of the Trump administration mentioned the executive orders at a meeting of staffers in the EPA's Office of General Counsel on Tuesday, but did not provide details about what the orders would say, said the sources, who asked not to be named. "It was just a heads-up to expect some executive orders, that's it," one of the sources said. The second source said attendees at the meeting were told Trump would sign between two and five executive orders. Trump administration officials did not respond to requests for comment. Trump has promised to cut U.S. environmental rules - including those ushered in by former President Barack Obama targeting carbon dioxide emissions - as a way to bolster the drilling and coal mining industries, but has vowed to do so without compromising air and water quality. Trump has also expressed doubts about the science behind climate change and promised during his campaign to pull the United States out of a global pact to combat it. Since his election in November, he has softened that stance, saying he would keep an "open mind" to the climate accord. 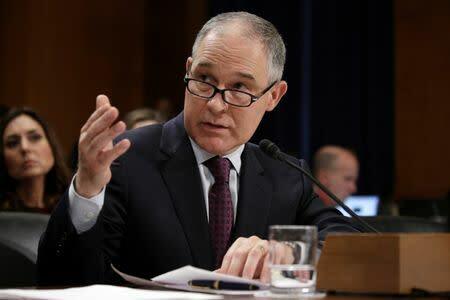 Trump's pick to run the EPA, Oklahoma Attorney General Scott Pruitt, is scheduled to face a Senate confirmation vote on Friday, according to a Senate aide, after a contentious hearing last month in which lawmakers pressed Pruitt on his ties to the oil industry. Pruitt sued the EPA more than a dozen times to block its regulations while he was the top prosecutor for the oil and gas producing state. Some Republican lawmakers, emboldened by Trump's election, have raised pressure on the EPA in recent days. On Tuesday, Rep. Lamar Smith, chairman of the House of Representatives Committee on Science, Space and Technology, asked the EPA's inspector general to investigate whether EPA staff were using encrypted messages to coordinate efforts to derail the new administration's agenda, in possible violation of federal records laws. Earlier this month, Rep. Matt Gaetz introduced a 45-word bill to "terminate" the EPA - a piece of legislation that is not expected to pass.